This is my country Iran and basic human rights violation continues. (Washington, DC, July 27, 2007) – The Iranian government should immediately release 19 students and activists arrested in May and June on apparently politically motivated charges, Human Rights Watch said today. Human Rights Watch expressed concern that the authorities have been subjecting them to abuse to coerce confessions. On July 24, the families of detained students Majid Tavakoli, Ahmad Ghasaban, and Ehsan Mansouri sent an open letter to Ayatollah Shahrudi, head of the Judiciary, about the physical and psychological abuse of their sons in section 209 of Tehran’s Evin prison, a security section of the prison where Human Rights Watch has documented many cases of prisoner abuse, including torture to coerce confessions. Following two visits with their sons, the families alleged that authorities have subjected them to 24-hour interrogation sessions, sleep deprivation, and threats of harming the prisoners and their families. The families also said that the detainees had been confined in cells with dangerous convicted prisoners, beaten with cables and fists, and forced to remain standing for long periods of time. The three students were among eight whom agents of the Ministry of Intelligence arrested in May on charges of “insulting state leaders,” “inciting public opinion,” and “printing inflammatory and derogatory materials” in student publications. The students consistently maintained that the publications were forged and that they had no role in producing them. On July 18, five of the students were released on bail. Six additional students were arrested on July 9 during a peaceful demonstration to protest the detentions outside the main gate of Amir Kabir University. They were holding a sit-in at the university to commemorate the anniversary of extensive student protests in July 1999 that the government violently suppressed. According to reports from activists, police and plainclothes security agents beat and arrested the six students and transferred them to Evin section 209. 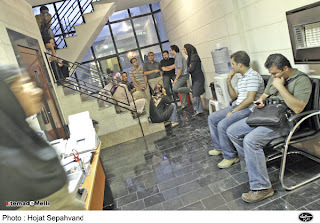 Later that day, at 11:30 a.m, plainclothes officers arrived at the Office of the Alumni Association of Iran. They fired in the air before forcefully entering the premises and arresting 10 students and activists. The police then closed down the offices. The Office of the Alumni Association of Iran is legally registered in accordance with amendment 10 of the Law of Political Parties. According to Iranian law, written notices and court appearances are required for shutting down legally registered organizations. Since the July 9 arrests, security officials stormed the homes of seven of the detainees and confiscated their personal belongings. On July 18, security agents ransacked the home of Abdollah Momeni, bringing him along from prison in handcuffs. According to activists who met with Momeni’s family following the search, Momeni’s face and body showed visible signs of beatings, and he appeared to have lost a considerable amount of weight during his nine days in custody. Security agents reportedly conducted the other home searches in a similar fashion. Human Rights Watch is also concerned about the well-being of 19-year-old Amir Yaghoub Ali, a student supporter of the One Million Signatures Campaign, which aims to eliminate discriminatory laws against women. On the evening of July 11, Yaghoub Ali was collecting signatures at Tehran’s Andishe Park on Shariati Street. Park security officers, after detaining him in the park’s security headquarters, transferred him to the 104th police station in Niloufar Square, where he spent the night. The next morning, authorities transferred him to the Revolutionary Court on Moallem Street, where Judge Sobhani ordered that he continue to be held pending completion of investigations into his case. His mother and sister were not able to obtain information about their son either at the police station or the courthouse on July 11. Upon their return to the court on July 12, Judge Sobhani informed them that he had ordered Yaghoub Ali’s transfer to Evin section 209. Activists in Iran told Human Rights Watch that authorities are particularly vindictive toward male supporters of campaigns for women’s rights. A witness to the peaceful women’s protest of March 8, 2006 in Tehran’s Daneshjoo Park told Human Rights Watch that when security and police forces attacked the gathering with batons in order to disperse the crowds, they severely beat the men who were present. 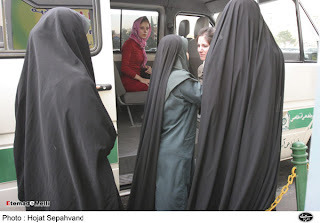 Brave Iranian women resist daily against intimidation, arrest, imprisonment , violation of their basic human rights in the name of Islam by the Islamic Republic in Iran. Here two women are arrested because of the way they are dressed. What is wrong with that? Human Rights and Democracy & then they will be able to push back Islamic Republic in Iran. Save the life of Adnan Hassanpoor an Iranian Kurdish journalist and Heywa Butimar a human rights advocate! Both of these gentlemen are sentenced to death in Iranian courts. Adnan Hassanpoor is editorial member of " Aso " a weekly Kurdish-Farsi publication and a member of the writers Association of Kurdistan. Heywa Butimar was arrested by security agents and was kept as a hostage for the return of his brother Hadi Butimar who has escaped persecution and refuged to England. The death sentence of Adnan Hassanpoor and Heywa Butimar has been approved by the court in Sanandaj an Iranian -Kurdish city.And the security agent have reported the aproval of the death sentence of Adnan Hassanpoor to his family.Now both of them are close to death and their lives is in danger. They need our support . About Said Mortazavi ,Tehran prosecutor and the number one enemy of journalists,press freedom and Human Rights and Democracy in Iran. He is as well one of the alleged interrogator and beating to death of Zahra Kazemi the Canadian - Iranian photojournalist. Said Mortazavi :The reason for me being promoted is because of my virtue. 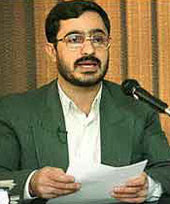 In the past week Said Mortazavi has ordered the execution of 16 rascals and villains and the order was carried out. He said: in near future he is going to execute another 17 people. These executions is taking place at time which a wave of arrest and imprisonment as well as violence is taking place against students , womens , teachers, workers, journalists and human rights advocates as well as lawyers. Two days after these executions he has appeared in national TV together with Tehran's police chief. Majid Tavakoli, Ahmad Ghasaban and Ehsan Mansuri are the three imprisoned students. The families of this three students of "Tehran Polytechnic University" wrote a letter to Ayatollah Shahrudi The head of the Iran's judiciary power and complained about what has been going on to their son's and requested for immedita investigation to their situation. 80 days have past since their arrest and the students claime they have been physically and mentally tortured. Kurdish northwestern region, on 16 July 2007.
who did nothing but exercise their right to inform their fellow citizens. Islamic Guidance. He wrote about the very sensitive Kurdish issue. Hosmandi, he was transferred to Sanandaj prison on 18 July. national security" (see IFEX alert of 12 July 2007 and others). most repressive countries as regards freedom of expression in the media. is especially fraught in the Kurdish northwest. 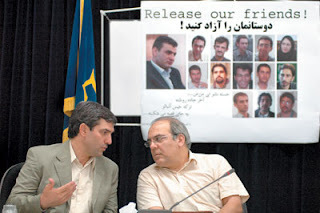 (New York, July 18, 2007) – The Iranian government should cancel the scheduled July 18 broadcast of the “confessions” of two detained Iranian-Americans, Human Rights Watch said today. Human Rights Watch expressed concern that Iranian authorities have used coercive means to compel Haleh Esfandiari and Kian Tajbakhsh to make statements that may be later used to incriminate them in court. On July 16, 2007, Iranian television announced that Channel One would broadcast the “confessions” of Esfandiari and Tajbakhsh at 9:45 p.m. on July 18 and July 19. The authorities have held them in largely incommunicado detention for more than two months, preventing lawyers and family members from visiting them. They have only been permitted brief phone calls to family members. 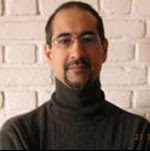 Iranian television on July 16 ran an advertisement for a program, “In the Name of Democracy,” that showed Esfandiari and Tajbakhsh speaking about “velvet revolutions.” Canadian-Iranian philosopher Ramin Jahanbegloo, whom the authorities arrested in April 2006 and released after four months of detention once he had “confessed” that his scholarly work had contributed to the planning of a “velvet revolution,” is also featured in the video. Esfandiari, 67, has been in Tehran’s Evin prison since May 8, 2007, when officials at the Iranian Ministry of Intelligence summoned her for questioning and then arrested her without warrant (http://hrw.org/english/docs/2007/05/12/iran15914.htm). Several days later, authorities arrested Tajbakhsh and detained him at Evin prison. Both have been held in solitary confinement. Esfandiari’s lawyer, the Nobel Peace Prize winner Shirin Ebadi, says that authorities have not allowed her to meet with her client or to examine her case files. 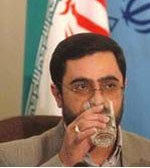 Ebadi also said that Esfandiari’s health was deteriorating as a result of the harsh conditions in prison. International human rights law protects detained persons from mistreatment, including making forced “confessions.” The International Covenant on Civil and Political Rights, to which Iran is a party, protects the right of every person “[n]ot to be compelled to testify against himself or to confess guilt.” It is unlawful for authorities to use coercive means to obtain incriminating statements. Broadcasting such statements is a form of degrading treatment prohibited by international law. Two other Iranian-Americans, Parnaz Azima and Ali Shakeri, are also currently facing similar charges of “acting against national security.” Like Esfandiari, both were in Iran for family reasons. Authorities have detained Shakeri in Evin prison since May, around the same time that Esfandiari and Tajbakhsh were arrested. Shakeri serves on the Community Advisory Board of the Center for Citizen Peacebuilding at the University of California, Irvine. He also belongs to a group that advocates for a secular and democratic Iran. Parnaz Azima, a reporter for the US-funded Radio Farda, is not currently in custody, but authorities have confiscated her passport and have barred her from leaving the country. She is currently out on a 510 million Toman (approximately US$540,000) bail. Students rallied for their rights. Because of the students , teachers, women , labor movements; the movement for " Democracy and Human Rights " in Iran is becoming stronger. Despite of arrest, imprisonment , torture and expulsion from university the students continue their protest. I think what they want is just freedom. That simple . Students that are in prison . Women's rights advocates together with many other civil rights activists are demanding for detained students release. by death, as is allowed under Iranian law. negotiations with the victim’s family. until they reach 18,before being executed. reprieved by the murder victim’s family. crimes of which they are convicted. abolishing the death penalty altogether. the supreme court is supposed to issue a decision this week. urging them to continue to condemn the denial of justice in this case. time of her arrest until her death." 2005 by an appeal court, which said the investigation should be reopened. (Washington, DC, July 11, 2007) – Iran’s top Judiciary official must act immediately to prevent the execution by stoning of Mokarrameh Ebrahimi, a 43-year-old mother of three, Human Rights Watch said today. In a letter to the official, Ayatollah Mahmud Hashemi Shahrudi, Human Rights Watch urged prompt action to prevent the stoning and called on the Iranian authorities to revoke regulations under the country’s Islamic Penal Code that permit execution by stoning. Despite a written stay of execution, local officials stoned to death Jafar Kiani, the father of two of Ebrahimi’s children on July 5. Kiani and Ebrahimi were convicted of adultery 11 years ago and sentenced to death by stoning by Branch 1 of the Criminal Court in Takistan, a city in the north central province of Ghazvin. On June 20, 2007, Ayatollah Shahrudi issued a written order staying the execution, which had been scheduled for the following day. Previously, in 2002, he had ordered a moratorium on executions by stoning to Iran’s judges. Despite the written stay of execution and the 2002 moratorium order, officials stoned Kiani on July 5 in Aghche-kand, a small village near Takistan. “Unless Iran excises stoning from the penal code, officials will feel free to impose such sentences and then carry them out,” Stork said. Tehran -- Iran's state broadcaster launched a 24-hour English-language news channel yesterday in a bid to break what it called the "stranglehold" of the West over the world's media. The Tehran-based Press TV is promising the usual diet of twice-hourly news bulletins, talk shows and documentaries, but with a distinctly Iranian spin. "There are few media which rightly fulfill their responsibilities," President Mahmoud Ahmadinejad said at the opening ceremony. "The media are used by the domineering powers to occupy lands and people's hearts," he said. Picture shows "Ham-Mihan's" journalists without job. In the past week " Ham-Mihan" newspaper for no reason was banned. " Mosharekat " newspaper's permission to publish was cancelled. pressures on "Etemade Melli" newspaper was increased. " Nedaye Kordestan" Weekly was banned and many kinds of pressure on " ILNA " (Iran's Labor News Agency) forced its president to resign and of course during these time there were alot of illegal and immoral confrontation with other independent newspaper as well. In this situation these newspapers are trying to publish the truth about the society but even this is not being tolerated by the Government's media watch dogs. At the end "Daftare Tahkim" has greeted the independent journalists and newspapers including "ILNA" and condemned pressure by Government on media and journalists. 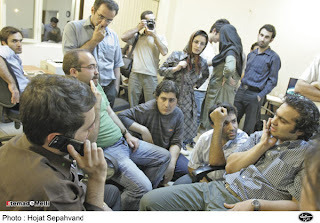 "Based on article 168 of the constitution, the media trial must take place with the presence of media juries ( media watchdogs ) and it must be an open court trial and the manager in charge of the newspaper must be tried by the jury but in Iran if the manager in charge is not present in the court his lawyer will be tried and sentenced. " Once again " Ham-mihan" newspaper is closed ! According to a report from "Etemad Melli" newspaper, After 43 issue " Ham-mihan" newspaper once again has been closed by the order of Tehran's prosecutor ( Judge Said Mortazavi). "Ham-mihan" had resume its publication after seven years with an order from division 1083 of Tehran's general court. But the manager in charge of the newspaper Mr. Karbaschi have annouced that the newspaper once again has been closed. of journalists detained in Iran to six. computer hard disk and CD-ROMs. He was immediately taken to Evin prison. ( http://www.insaniyet.com ) has been blocked several times. health problems and needs a thorough medical examination. has requested release for hospitalisation. banned from leaving the country. disturbances were attacked by members of security forces or by rioters. The information contained in this alert is the sole responsibility of RSF.